A breviary is a prayerbook giving the prayers, hymns, and readings for divine office, the cycle of devotions which monks recited daily. They can vary in size, this one being on the small side and so considered to be a 'portable breviary.' Its origins are uncertain, but in 1486 Thomas Harwode, chaplain, gave it to the parish church of Penwortham, Lancashire. 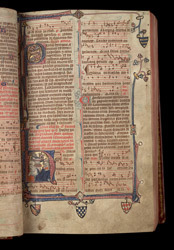 The Penwortham Breviary preserves one of the oldest, most complete examples of the divine office according to Sarum Use, or as recited in much of medieval post-Norman England. On a page of hymns and prayers for the Christmas Day, a small picture of the Nativity decorates the responsory (hymn sung by a soloist and based on a scriptural passage that varies with each day's office). Musical notation is rare in a small, 'portable' breviary. Four coats of arms (from left to right, of the Despenser, Warren, Fitzwilliam and Constable families) hanging from the lower border were probably added soon after the manuscript was made.